A beautifully-furnished shepherd’s hut made for two on a camping and glamping site in the Norfolk Broads National Park. Our Shepherds hut was lovingly handcrafted right here in Norfolk by our friends at the English Shepherds Hut Company, It are based on a traditional Shepherds hut design and comes furnished with beautiful boutique fittings. 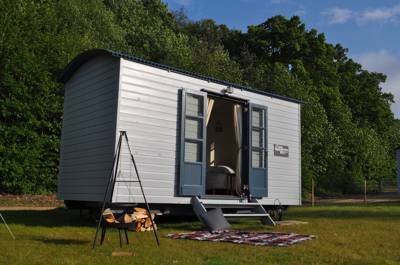 The Shepherds hut 'Lola' is just waiting for you to move in, bedding is provided, with 1 full size single and 1 full size double bed . Lola can comfortably accommodate 3 people and is the perfect romantic or family retreat. Our Shepherds Hut is cool in the summer and cosy in the winter, with a log burning stove and sheeps wool insulation - The hut is available to book all year round. There is 1 car parking space which is just behind the hut. Additional spaces are charged at £5.50 per day.